Being Mum: So much washing! I've just done my fourth washload in three days. WTF! First I got all the adult washing out the way - that was two washloads. Then I changed the bed sheets - one washload. 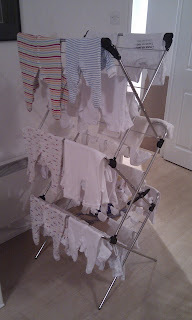 Now I've just done baby clothes and because it's all so tiny, there's LOADS of it! It's taken me half an hour to hang it all up, and I'm gonna have to do a baby washload every other day, what with the clothes, the nappies, the wipes, the blankets. And I have to fit 'normal' washing in there somewhere. So tomorrow is more washing for me - the blankets, musline squares, sheets and the few clothes I didn't do today. Sigh.